The beautiful blue of the Sawyer Glacier in South East Alaska contrasts with the rocks along the side of the glacier path. 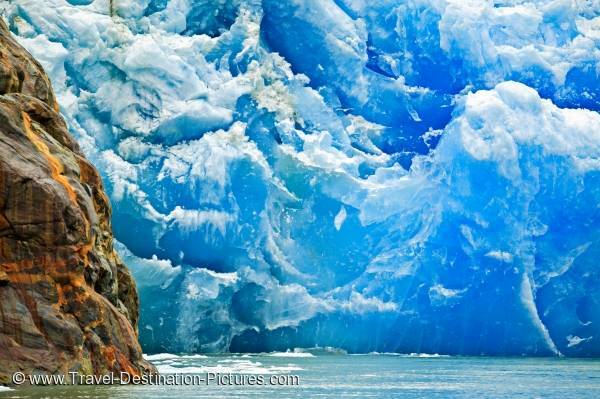 The Sawyer Glacier is situated in the Tracy Arm inside the Tongass National Forest of Alaska, USA. Tour boats depart from the cruise ship port of Juneau, the capital city of Alaska, for the Sawyer Glacier on a daily basis during the summer cruise season. During a tour to the Sawyer Glacier passengers frequently see humpback whales, seals and marine birds plus stunning coastal scenery. Picture of the face of the Sawyer Glacier in the Tracy Arm of the Fords Terror Wilderness Area in Alaska, USA.